Simple to prepare, easy to clean up - this all-in-one skillet dish is ready in under 40 minutes. 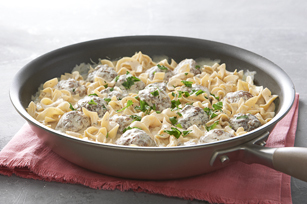 Garlic & Parmesan-flavoured meatballs combine with egg noodles and a creamy sauce in this delicious recipe. Mix meat, Parmesan, garlic and egg just until blended; shape into 18 (1-1/2-inch) meatballs. Cook in nonstick skillet on medium heat 6 min. or until evenly browned, stirring frequently. Add flour and seasoning; cook and stir 1 min. Spoon meatballs to edge of skillet. Add broth and water to centre of skillet; bring to boil. Place noodles in centre of skillet; press with back of spoon to completely cover noodles with liquid. Cover with lid. Simmer on medium-low heat 7 to 8 min. or until noodles are tender and sauce is thickened, stirring after 4 min. to combine all ingredients in skillet. Meanwhile, mix cream cheese product and milk until blended. Add cream cheese mixture to skillet; cook and stir 2 to 4 min. or until heated through. Sprinkle with parsley. Omit Italian seasoning, and prepare using Philadelphia Herb & Garlic Cream Cheese Product or Philadelphia Chive & Onion Cream Cheese Product. Prepare using extra-lean ground turkey. Meatballs can be shaped ahead of time. Refrigerate up to 24 hours before cooking as directed.